Https://farm8.staticflickr.com/7823/40537578153_ceec19f668_o.jpg . ** **Manual is an attitude, a kind of practice, is the unique work of the craftsman with the time! ** **I would like to dedicate to you who love life as well, and wish it to spend a happy and beautiful time with you! ** . . Https://live.staticflickr.com/7906/46618400575_9dc1d87e67_b.jpg Https://live.staticflickr.com/7908/46618622255_07b7716bfd_b.jpg 💎 **[ Product Features 】** • Korean woven canvas + Italian vegetable tanned leather (exclusive pleat effect treatment) • Fresh and versatile, art and leisure, • Comfortable wide shoulder strap, • Large capacity, can hold a lot of items, • Inside zip pocket and vertical pocket, front pocket and magnetic closure for easy use! Https://farm8.staticflickr.com/7913/46588510175_69bb213c81_o.jpg ❤ **[Customer Project]** • Only print the English letters A~Z, numbers 0~9 and + - • , & # @ $ % ! ? These characters (the best imprinted content is kept within 8~12 characters) • The default mark is printed on the shoulder pad in the middle of the shoulder strap of the backpack. Please write the note in the order, or contact the designer to explain • Font type [word height 3m/m] ➣ (Note that each letter or number is hand-cut one by one, not as machine-like and precise, but with the warm touch of a unique hand-written text, if you mind not to try lettering) Https://live.staticflickr.com/7866/46810153544_de9f27589d_b.jpg 📐 **[ Size specifications 】** ▸ Width: 390mm ▸ Height: 320mm ▸ Thickness: 110mm (★Handmade and measured, there may be differences and differences, please forgive me!) Https://live.staticflickr.com/7918/40568101573_f463957aa5_b.jpg 🏆 Front outer pocket, based on practical and user-friendly design, some common small items such as paper towels are more convenient to take here. Https://live.staticflickr.com/7831/46618400525_5265017ea3_b.jpg ◆ Each corner is carefully spliced and carefully sewed, whether it is heavy or long-lasting, it is worthy of your trust. Https://live.staticflickr.com/7891/46810153494_c54e292009_b.jpg ◆ High magnetic closing buckle, it is more convenient and quick to use Https://live.staticflickr.com/7865/46618400435_144c90a6bc_b.jpg 💼 【Space Capacity 】 ▸ Interior: 1 large zip pocket, 2 inner patch pockets, 1 large main storage space ▸ Exterior: 1 large external pocket Https://live.staticflickr.com/7805/46810153354_95b76f4193_b.jpg Https://live.staticflickr.com/7926/46618400155_781f45a5d3_b.jpg ❤ The leather surface has been waxed and cured. The European-based multi-fat vegetable tanned leather fiber is more evenly distributed than the dense oil. The leather will be stronger, more beautiful and more lustrous with the use of time. It is like wine. The more mellow the alcohol ~ This is the charm of handmade leather making! . . ✪ **[Leather care]** 1. Use it regularly is the best maintenance! Hand grease is good for leather, or regular leather care oil 3. Leather products should be protected from moisture and water during use. If you accidentally get water, use a dry cotton cloth to dry, then place it in a cool place and dry it. Do not expose it to the sun. 4. 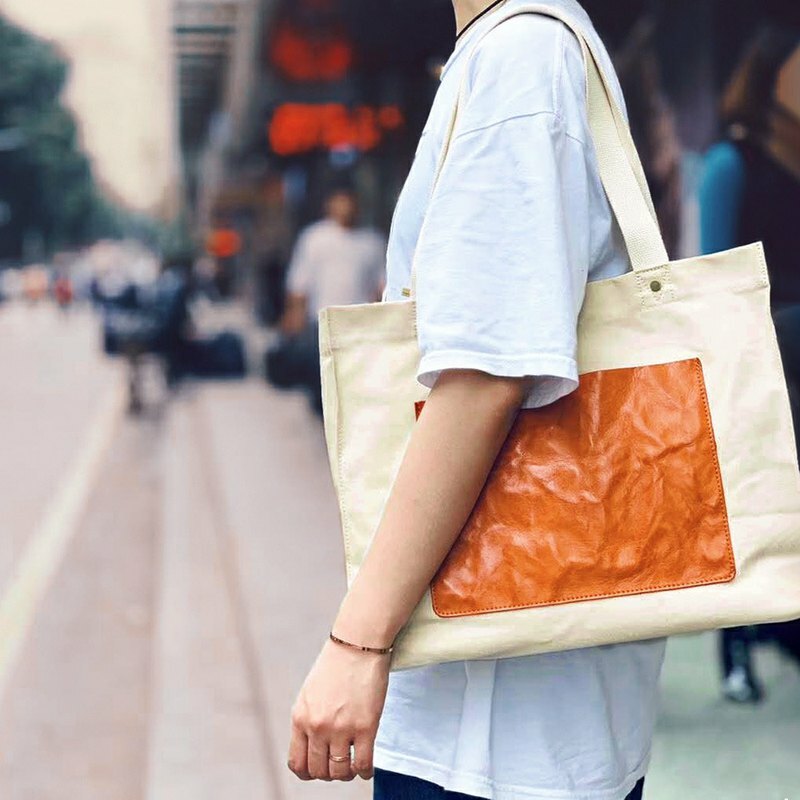 If the leather is not used for a long time and it is found to be moldy, please wipe it with a dry cotton cloth, place it in a ventilated place, and then wipe it with leather maintenance oil. . . Https://farm8.staticflickr.com/7868/32561435467_f7e3321e53_o.gif . . ♆ **[Designer's sentiment]** • Life should be sunny and upwards, not just cold technology, the same line. Handwork is a life attitude, a practice, a practice of not only craftsmanship, but also inner heart. Only 100% concentration and input, in-depth details, can give life happiness, in order to give each piece a character, human touch, and the value that industrial products can not reach. Because "hand" has always belonged to the creator rather than the copy. Every handmade product is unique, and the unique texture of the handmade products will give you strength and perseverance, and provide unlimited imagination! • When the “fashion” standard is defined by most people as “industrialization” and “quantity products”, I hope that in addition to the standards of public pursuit, people can help people discover the charm of handicrafts. Combining the connotation beauty of Chinese traditional crafts with modern fashion, the artistry, fashion and practicality of the items are streamlined in the design, and the warmth and exquisiteness of the hand-made system creates a unique life aesthetics above the perseverance. With the combination of modern aesthetics and the power of natural life, we create hand-made works that lead the personal style. ✉ If you have any other questions, please feel free to contact me and I will reply within 12 hours (except weekends) Thank you very much! Thank you very much! ! !